Confused which one to use for your birds or when you should use them? Probiotics are the "good" bacteria or intestinal flora found naturally in the intestines of a healthy bird. These good bacteria crowd out disease causing organisms by competing with the "bad" bacteria preventing them from taking over nutrients and attachment sites. When birds are being treated with antibiotics, the treatment kills good bacteria along with bad. This will require a rebalancing of your bird's intestinal flora. 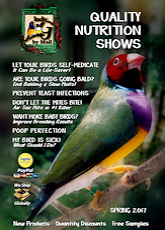 Supplementation with probiotics helps restore the balance of beneficial bacteria in the birds gut. Prebiotics work differently from Probiotics. Unlike probiotics, prebiotics do not consist of friendly bacteria, but instead promote the growth of naturally occurring friendly bacteria already naturally present in the gastro-intestinal tract. These friendly bacteria act in a way that keeps the bowel healthy and free of disease forming bacteria. Lactobacillus and Bifidobacteria are considered the most significant "friendly" bacteria in birds. 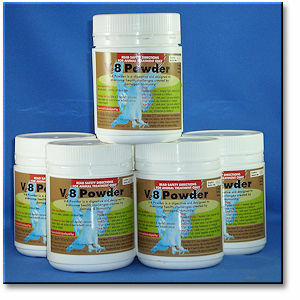 Ve8 Powder includes 2 prebiotics (MOS and FOS) that promote the proliferation of these beneficial bacteria. Prebiotic Definition – a prebiotic is a non-digestible dietary ingredient that beneficially affects the host by stimulating the growth of and/or activating the metabolism of healthy promoting bacteria (normal gut microflora) in the intestinal tract. Prebiotics limit the development of disease forming bacteria in the digestive tract in a natural way. They act by promoting the growth of "friendly" acid forming bacteria and other bacteria that inhibit the growth of toxic gas forming bacteria that have suddenly appeared as a result of sluggish digestion. In many instances, prebiotics can replace the need for antibiotics when used at the start of digestive disturbances. They also have a positive effect on nutrient digestibility, improve droppings quality and assist with natural immune defenses. 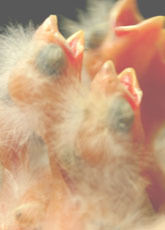 The digestive process in birds begins when food enters the crop. The crop acts as a storage organ where food is softened. The food then passes into the stomach where it is mixed and further softened with acidic digestive juices. After a suitable time in the stomach, the partially digested food moves into the gizzard where it is pulverized into small particles. The pulverized food then passes into the intestine where digestive enzymes chemically extract nutrients so they can be absorbed and assimilated into the body. Healthy digestion is defined as the fastest possible rate of complete digestion. This means the food passes through the gut very quickly. Unhealthy digestion occurs when there is a slowdown of the passage of food through the gut. This sluggish digestion causes rapid fermentation and toxic bi-products that cause sudden and serious illness that is potentially fatal. Birds at most risk to sluggish digestion and the harmful effects of gas forming and other bacterial gut infections are those with underlying health issues. When should we use Prebiotics on our birds? Ve8 Powder is also used to protect pet birds from the inescapable contamination problems associated with the household environment. All pet birds, especially those allowed regular free-flight opportunities within the household setting, will become exposed to some form of health-damaging contamination irrespective of the level of cleanliness and hygiene employed. Ve8 Powder is used with Quikgel as the first line of attack to treat and control gastrointestinal infections associated with these everyday pollutants. The free-flying experience is highly beneficial for the happiness and well being of pet birds. This activity should be encouraged but there must be protection from known contamination sources such as high curtain rails, shelves etc. where dust accumulates quickly. Weekly cleaning and disinfecting (Pet Focus) of these known roosting areas is needed to control re-infection but this routine may not give full protection against these key areas of contamination. These infection dangers are most likely to surface following warm humid and wet weather conditions. Staphylococcus, Klebsiella, other bacteria, yeasts and molds, are the most common environmental germs. It is inevitable that at some time pet birds allowed regular free flight opportunities will be exposed to potential harm from these sources of contamination. Ve8 Powder has been developed to control gastrointestinal infections associated with these dangers. Dr Rob Marshall's Ve8 Powder is a combination of 2 carefully selected prebiotics, (MOS and FOS) yeast metabolites and remedial herbs. The prebiotics in Ve8 Powder represent a holistic means for managing the health of the digestive tract in birds. MOS is a prebiotic derived from the cell wall of fermented yeast. This yeast by–product is included in Ve8 Powder for its role in acidifying the bowel. Most digestive disorder decrease the acidity of the stomach and intestines, which predisposes to the sudden overgrowth of harmful bacteria. Physiological stress associated with changing weather conditions, the exertions of feeding babies, hawk attack, physical over exertion from a toss or race, etc. is the underlying cause of this digestive disturbance. The role of MOS is to stimulate the growth of Lactobacillus in the intestinal trace to product lactic acid. It is the acidifying effect of this bacterial proliferation that inhibits the growth of disease-forming E-coli and toxic gas–forming clostridia-type infection. FOS is a prebiotic specifically selected for its ability to naturally control and prevent gas forming bacterial infections associated with sluggish digestion or ingestion of contaminated food or water. The combined effect of MOS and FOS is to restore the normal rate of digestion by increasing the acidity of the bowel and preventing fermentation by disease forming bacteria. Significantly, prebiotics offer the best opportunity to maintain perfect droppings, which are the window to health digestion. Ve8 Powder is included in the treatment plan for all of these conditions. Ve8 Powder is given as part of the immediate treatment plan to aid the function of antibiotics in eliminating gut infections. It then replaces antibiotics as a means for controlling future infections while your bird fully recovers from its digestive disorder. Ve8 Powder is also used with Quick Gel as a first aid treatment whenever symptoms of indigestion arise. Birds with long-standing digestion disorders caused by vitamin D deficiency, fatty liver disease, dietary deficiencies and ongoing ovarian dysfunction may require ongoing Ve8 therapy for several months. A much shorter 2-4 week course of Ve8 Powder is given following an acute onset digestive disorder (e.g. ingestion of foreign matter or contaminated foodstuff) in previously healthy birds. On occasion, continuous Ve8 Powder therapy may be required to control persistent gut infections in birds that have suffered permanent damage to the digestive organs as a result of a serious injury or chronic illness. This first aid treatment it given at the first signs of illness. Silence, reluctance to leave the cage for flight exercise, a fluffed up look and watery greenish droppings are sign of a health failing. These changes appear suddenly and are most noticeable in the morning. 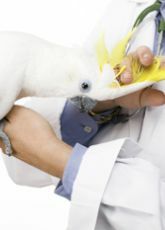 Therefore a regular morning health check gives the best opportunity to prevent illness in birds susceptible to digestive disturbance by identifying health failing in their infancy and initiating the Ve8 first aid treatment as early as possible. Ve8 Powder is mixed in the seed with Turbobooster, E-powder and F-vite immediately when your bird shows any sign of digestive disturbance. Quickgel is given in the drinking water. During this first aid treatment, which is given for 2-3 days, your bird must be caged where it can rest and be protected from outside contamination. Full recovery should be noticed by the third morning following this first aid treatment plan as your bird starts to make noises of happiness, seek your attention and its droppings are no longer watery. KD is then given for 1 day after which time your regular health program is resumed. Seek veterinary advice when your bird fails to show signs of increased activity by the second day of Ve8 and Quickgel or has not fully recovered it normal behavior by the third morning. Ve8 Powder can be used in several ways. It can be given for 2 consecutive days as part of an ongoing program (e.g. breeding, young bird or race program) or given for 3 days as part of the Dropping Health Plan when droppings "go off". Ve8 Powder is given at the first sign of wet, green or enlarged droppings. It is given for 3 days together with Turbobooster, e-powder and F-vite. There will be a return to healthy small, brown hued and white capped droppings by the second afternoon or third morning when Ve8 Powder is started at the first sight of altered droppings. Quickgel & Ioford are given in the drinking water for the first 2 days and KD is given on the 3rd day of treatment.